Everyone loves cinnamon rolls. There's something about the aroma of bread laced with sugar and cinnamon baking in the oven that evokes memories of your childhood. In fact, there is no better food to serve at breakfast or brunch! 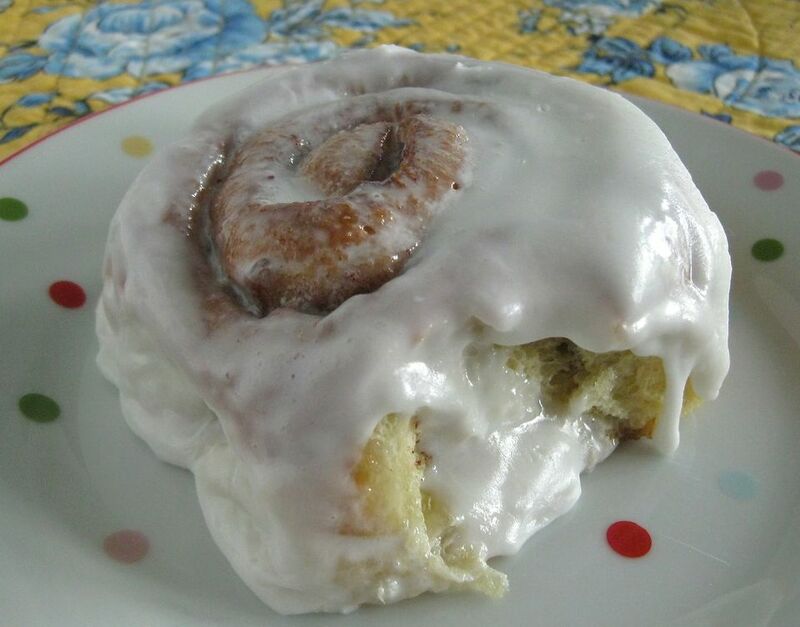 Most recipes for cinnamon rolls are very complicated, with yeast dough made from scratch, rising two or three or even four times, and complicated fillings and frostings. You don't have to go through all that to make a fabulous cinnamon roll. The best time saver: frozen bread dough. Let the dough thaw according to the package directions, then make the filling and frosting. Assemble the rolls, bake them, slather on the frosting, and dig in! Remember this easy and fabulous recipe for the holiday season, when you want something special for overnight guests or need an easy treat for Christmas morning. These rolls are perfect every time. Spray a 13" x 9" baking pan with nonstick baking spray containing flour and set aside. Unwrap the bread dough. Sprinkle the work surface with a little flour. Roll the thawed dough into an 18" x 8" rectangle using a rolling pin sprinkled with a bit more flour. In a medium bowl, combine the brown sugar, granulated sugar, chopped nuts, melted butter, and cinnamon and mix well. Spread this mixture evenly over the rolled out dough. Starting with the long side, carefully roll up the dough. Make sure you roll tightly enough so there are no air pockets or spaces in the roll, but roll so tightly that the filling starts to come out the sides of the dough. Seal the long edge by pinching the dough together with your fingers. Cut the dough into 12 1-1/2" slices and place, cut side down, into the prepared pan. Cover the pan with a kitchen towel and set aside in a warm place. Let the dough rise for about an hour or so until it is doubled and the rolls fill the pan. About 10 minutes before the dough is risen, preheat the oven to 350*F. Bake the rolls for 20 to 30 minutes or until they are golden brown. The temperature of the dough, if you want to go that route, should be about 200°F. Cool the rolls in the pan for about 10 minutes, then carefully remove the rolls to a wire rack to cool completely. When the rolls are almost cool, combine the cream cheese, butter, powdered sugar, and vanilla in a medium bowl. Beat until smooth and creamy. Frost the rolls with the frosting mixture.